DS9 Re-watch, 2.1–2.3, "The Homecoming", "The Circle", & "The Siege"
Star Trek: Deep Space Nine returns with a second season and a three episode arc giving you more Kira than you can handle, plus jazzy Sisko soliloquies. Guess what two strips of gold pressed latinum will get you. Yes, there will be spoilers. We return to a station bustling with activity. Quark and Odo are bantering — just like old times — when Quark goes to meet/flirt with a freighter captain. She’s brought him a gift: a Bajoran earring that she’d smuggled off Cardassia IV. On instinct he takes it to Major Kira because she’ll know what to do with it, and so he can get a sneak peak at her bedroom. She’d throw him out but instantly recognizes whose ear ring this is. Opening credits roll and we get teased with that sweet, Season Two production money in the form of the Promenade’s second level. Commander Sisko is strolling along looking for Jake. Kira finds him at the Replimat with a huge favor — she wants to *borrow a Runabout to rescue a Bajoran prisoner-of-war named Li Nalas from a forced-labor camp on Cardassia IV. When asked why she brought this to him instead of the Bajoran Provisional Government she relates that: a) they already said “no” for fear of provoking war, b) the planet is in turmoil since the loss of Kai Opaka, and c) Bajor has no real leadership. Sisko says he’ll take all of this under consideration as he’s called to the Habitat Ring. Someone on the station has started vandalizing walls with the symbol of The Circle, a xenophobic, Bajoran movement who officially identify themselves as “The Alliance for Global Unity” whose call to arms is a Bajor for Bajorans. Sisko begins to appreciate Kira’s appeal to rescue Li Nalas. Back in Ops, Dax gives him even more reason to approve Kira’s request. Dax reminds him that the Cardassians swore that all prisoners of war were released from captivity when they pulled out of Bajoran space. With that piece of information he decides to give Kira a Runabout and orders O’Brien to assist — luckily O’Brien has already worked on a plan to disquise the shuttle’s power signature. After Kira warns O’Brien that this missions ends one way — with the rescue of Li — they set off to Cardassia IV on a Starfleet Runabout. They reach the planet only to discover that there are over a dozen Bajorans on the surface, so they have land and break Li out the hard way. They approach a security fence posing as a pimp and ‘ho’ teasing what the guard can get for two strips of latinum, and the guard falls for it. The guard also falls after Kira beats him senseless. A phaser fight ensues, and before long all the prisoners are fleeing back to the Runabout to get Li off the planet. They get off the planet but were unable to free all the prisoners, some had to remain and fight off the Cardassian guards. Though chased from the planet by warships they are greeted on the station by a message from Gul Dukat. He’s *shocked* to discover that the Cardassians still had prisoners in their custody and is calling to assure everyone that the Cardassians will be returning the Bajorans to Bajor as soon as possible. While Li Nalas gets medical care in Bashir’s Infirmary, Kira gets a surprise visit from a Minster of the Provisional Government, Jaro Essa. He’s come to let her know that she’s earned enemies in the Cardassian government for nearly provoking war, though he’s *glad* to point out that they declined to accept that provocation. After being released from the Infirmary, Li is greeted on the Promenade by a crowd of the station’s Bajorans. They’ve come to pay him regard and Sisko nudges Li to give them what they want, which he is incredibly reluctant to do. Li will prove himself many times in this series of episodes that his status as Living Legend is not something he wants or deserves. As the evening winds down we return to Quark’s Bar for payday — six pieces of latinum for Quark, one for Rom. Rom leaves in a tiff and Quark is assaulted by Bajorans who burn the symbol of The Circle onto his forehead. Bashir comes to treat his injury while Sisko, Odo, and Li discuss the growing problem The Circle poses to the security and safety of the station’s non-Bajoran population. Li is shocked to learn that Bajorans are being so violent to other aliens. Sisko returns to his quarters to find a heartbroken Jake — he was supposed to go on his first date with a Bajoran girl, but the girl’s father forbid her dating a non-Bajoran. The discrimination on the station is spreading in multiple ways. But he doens’t get to worry about that long before receiving a text from a freighter captain that Li Nalas tried to stow away on his ship to the Gamma Quadrant. During the Occupation, I was a member of a minor resistance cell. The name is unimportant. One day — this was in the mountains surrounding the Sahving Valley — we were ambushed by Cardassian troops, only three of us managed to escape. We hid in the hills for two days. Finally, the lack of food and water forced us down into the valley. We made our way to a ridge overlooking a small lake. As I was the only one still carrying a phaser I went on ahead to scout for the enemy. Halfway down the embankment, I slipped, went sprawling on my back down to the edge of the lake just as a huge Cardassian emerged from the water. He must have just finished bathing. He stood there frozen in surprise dressed only in his underwear, shivering in the cold. I lay there, looking up at him, too stunned to even move. And it was only when he reached for a phaser rifle that was lying across his clothes on a nearby rock that I realized that I was still holding my own phaser and I shot him. His body fell on top of me. And that’s how my companions found us a moment later. One of them recognized him as Gul Zarale, responsible for the massacre of half a dozen Bajoran villages. Now, I tried to tell them what had happened but they had already convinced themselves that I had killed Zarale in some kind of a savage struggle, which is what they insisted on telling every Bajoran that we met. And no matter how hard I tried to deny it the story continued to spread until it seemed all of Bajor had heard it. Soon every victory won by the Resistance was attributed to my leadership. Stories of my brilliance, my daring, my courage grew more and more unbelievable yet the people insisted on believing them. My reputation even followed me into the labor camp where my mere presence seemed to inspire my fellow prisoners. And I had done nothing but shoot an unarmed Cardassian in his underwear. I’ll never forget the look on his face when he died. He was so embarrassed. So you see Commander, I have done what Bajor needed me to do. I have allowed myself to be a slave to my reputation all of these years. And now it is enough. Li Nalas knows he is not the man that Bajor needs or wants him to be, but Sisko reminds him that Bajor “needs a symbol” and that’s what Li is. He tells Li, “They look at you and they see strength and honor and decency.” That through him the Bajorans “see the best in themselves.” Whether Li likes it or not, he is a Living Legend. Rather than run from it, he tries to embrace it, and is named the following day as Navarch — a position created specifically for him — and that he will replace Major Kira as Sisko’s liaison to Bajor, that Kira will be promoted for her service to Bajor by returning their hero. It’s easy to read between the lines hear, that Kira isn’t being promoted but punished, but to what end? Sisko immediately calls out Jaro in his office, but before he can give Jaro one of his jazzy soliloquies, Sisko is informed that The Circle has tagged the door to his quarters with their emblem. He’s got more trouble than he’s prepared to deal with. As Kira packs to leave she’s greeted by each of her colleagues. Odo has come to argue with her, upset that she’s giving in and not fighting back at her government. He always felt she had a “personal code” which caused him to respect her so much — once of course he sanded down her rough edges. This sets Kira laughing because she felt the exact way about him, right down to the rough edges she sanded down on him. Next is Dax returning something she borrowed, and inquiring if Kira knows what she’ll do with her life now. Bashir comes to wish Kira the best. O’Brien comes only to be dumbstruck with the argument Odo is picking at all of them for not being more upset that Kira is being removed form the station. Quark arrives with a small bottle of synthale hoping to *party* which nearly provokes an assault from Kira, just as Vedek Bareil shows up. His is the most unexpected. Bareil has heard through the proverbial grape vine of her relief of command, and has come to invite her to spend some time at his monastery. All packed up, Kira takes her last trip to Ops and is escorted by Sisko and Li to a Runabout. Li reveals that his new title means he answers to The Prophets, not the Provisional Government. A curious move by the government: why ship your Living Legend to a space station at the mouth of the wormhole? Why not bring him back to Bajor to unite the planet? There’s a game being played and Kira, Li, and Sisko are all pawns in it. At Bareil’s monastery, Kira is having a very difficult time relaxing. She’d rather break stones with a phaser than stack them in a Zen garden. He implores her to “explore ‘useless’” for a while. Bareil then takes her to see the Orb of Prophecy and Change (Orb #3). In her vision she finds herself surrounded in the Chamber of Ministers being questioned on all sides; Vedek Winn and Minister Jaro eyeing her down; Bareil consoling her in his own way; she and Bareil naked and being called “blasphemers” by Winn. It seems Bareil’s last visit with the Orb showed him a vision that featured Kira prominently, and he needs to know if hers featured him, but she can’t tell him. Back in the world, news reaches Odo that the Provisional Government has ordered the Bajoran Militia to mobilize against The Circle. A civil war is beginning. Quark comes to relay to Odo that he believes he knows how The Circle is getting its weapons — from the Kressari. With this knews, Odo issues Quark an ultimatum: he can be a deputy and find out more information, or he can sit in one of Odo’s cells. Quark opts for the latter. Odo is convinced all of this is a coup in disguise. Back at the monastery, Kira and Bareil are taunted by an ever judgmental Vedek Winn. She’s glad to see that Kira is taking some time off from her life of violence, and that Bareil is getting in some “recreation.” She’s also curt that Bareil didn’t consult her about taking Kira before the Orb. Make no mistake, Winn is up to her neck in conspiracy. Sisko travels to Bajor to meet with General Krim of the Bajoran Militia. Sisko is concerned over how The Circle is being combatted. He’s concerned over how they are being armed, relating his suspicions (courtesy of Odo) of who is supplying the Kressari with weapons to sell. He also wants Kira back on the station, and is unhappy at how Jaro setup her removal. Krim notes that Sisko could have asked for Kira back in exchange for information about The Circle, and that Sisko in fact didn’t play any games with him. He’ll remember that fact. Jaro: Major, I don’t have to tell you, I’ve heard your opinion of this government. Government? They can’t even agree it is a government so they call it ‘provisional.’ It’s just another word for powerless. I won’t allow the Bajoran people to be powerless anymore. We have been doormats to the Cardassians, and now the Federation — any great power that happens by. We will not be that again. We are a people who brought art and architecture to countless planets. We don’t deserve to be victims. Kira: If you want to change the government, Minister Jaro, you vote to change it. You don’t sneak up from behind it with a dagger. He’s kidnapped Kira because she knows Sisko better than anyone, and Jaro needs to know how he’ll react when Jaro’s actions become clear, that he’s staging a coup with cooperation from the militia. He goes so far as to offer her the station once Starfleet is driven off, and has to resort to having her beaten to get that information. In record time, Odo discovers that the Cardassians are using the Kressari as middle men to arm this Bajoran coup; and as soon as Starfleet is driven away from Bajor it will be left powerless against Cardassian invasion. Odo returns to the station with this information, as news reaches Sisko of Kira’s abduction, and (most conveniently) Quark has discovered the probably location of The Circle’s base on Bajor. The gang pursues this lead to Bajor, and after a subterranean battle, retrieves Kira. Back at the station they are able to put all the pieces together, including what Kira learned about Jaro. Before they can relay this information to the Ministers they learn that all communication to Bajor has been jammed. The episode ends with more political scheming. Winn is conspiring with Jaro for his support in the coming elections for Kai — the future leader of Bajor (Jaro) being a member of her obscure order would guarantee her election. All she has to do is turn a blind eye to his military coup. Back on the station, Sisko is upset to learn that Starfleet wants all personnel removed from the station. Getting involved with a civil war on Bajor would violate the Prime Directive — but it wouldn’t be Star Trek if a commanding officer let that stop him. Dax loves her prosthesis so much she’s thinking of keeping it. Where are you running to?! This is Bajor. We are Bajorans. We fought a war to regain our homeland. How can you abandon it like frightened Cardassian vole? These ships are for our guests who must leave because it is no longer safe for them here. However, we are Bajorans and I say that we stand and we solve our own problems. Together. Are you willing to join me? For someone who doesn’t want to be a hero, Li Nalas can’t seem to help himself. While the ships flee, Kira and Dax go to an old resistance base on a moon in the Bajoran system. The resistance left some ships at the base, and Kira hopes Dax can get them operational (because of a previous host’s technical know-how with engines, Tobin Dax) so they can take their evidence of Cardassian involvement to Bajor and the Council of Ministers (Provisional Government). This is the weakest of the episodes in the arc, in my opinion, because so much is condensed for time. The militia ignites a civil war on Bajor, while Sisko leads a resistance on the station, while Kira and Dax work to make it to Bajor all for expediting the plot. Random facts are dropped in the process: Trills are deathly allergic to insect bites, O’Brien can’t get enough combat rations, Quark is sensitive about his mother, Jaro is worried that Li Nalas will martyr himself, the sexual tension between Kira and Bareil. The ship Kira and Dax take to Bajor is shot down after a fire fight with other Bajoran ships, but they are retrieved by members of Bareil’s order, allowing Dax time to put on a prosthetic nose and hide her spots, don Vedek drag, and get their intel to the Council of Ministers — they are even allowed a chance to speak by Vedek Winn of all people. Simultaneously, Sisko and Li are able to convince General Krim of Jaro’s duplicity. They succeed, but not before one of Krim’s subordinates tries to shoot Sisko. Li Nalas jumps in front of the phaser blast, proving in the end that whether he believed it or not, he was a hero. The episode ends with Kira, Sisko, and O’Briend mourning Li over drinks by themselves in an empty Quark’s Bar. Kira is inconsolable. She was convinced that if she rescued him everything would have been resolved better. Kira: Somehow, you figured, now that he was here things would be better. You know, he’d … he’d find a way to make things better because he was a man who could do that. A great man. I wish I knew where we could find others like him. Sisko: Major, there are heroes all over Bajor. I’m sitting with one. With that jazzy soliloquy the Ballad of Li Nalas is put to rest, as they get news that the stations population that fled the coup are returning. And life goes on. First aired September 26, October 3, and October 10, 1993. This was Star Trek’s first series to feature a three-episode arc. The only other series to attempt this was Enterprise. Michael Piller mandated at the end of season one that the series should rely less on connecting with The Next Generation and focus more on standing out from it; which is interesting since this was originally an idea for an episode of The Next Generation — conceived that the Enterprise-D would encounter a Bajoran hoping to free a prisoner of war/resistance leader. Ira Steven Behr altered this concept from the story of a reluctant hero to that of a mistaken one, inspired in part by John Ford’s The Man Who Shot Liberty Valance. Frank Langella’s performance as Jaro Essa went uncredited at his request because he did the role for his kids who were fans of the series. 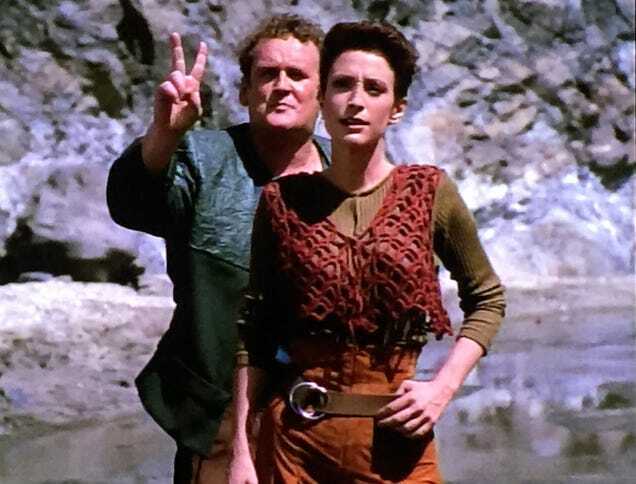 California’s Soledad Canyon served as the location for Cardassia IV; and would be used again in later seasons. Richard Beymer, who played Li Nalas, should be recognizable to some as Benjamin Horne from Twin Peaks. The freighter captain who smuggled the ear ring to Quark returns to show in two more episodes, but only gets a name in the last. Peter Allan Fields based the scene in Kira’s quarters from “The Circle” on the film A Night at the Opera. The scene was also shot in one long take, but edited together with close-ups from secondary shots. “The Circle” is the first time that Sisko’s baseball is shown on his desk. Bareil’s name is misspelled in the opening credits; but only in this episode. “The Siege” was the most demanding episode of the season because of the effects shot of Odo, the phaser fights, and the dog-fights over Bajor. Li Nalas’ death was an issue of contention among the producers who felt that he was built up too much to just kill him off. But Behr believed that having him sacrifice himself would complete his arc poetically. The producers also weren’t sure they could get Richard Beymer to sign on as a returning character. Winrich Kolbe, who directed the episode, felt that making this arc three episodes was overkill, that it should have been condensed to two episodes. Steven Weber has a small part as a Bajoran Militia officer, Colonel Day, who tries to kill Sisko when the coup fails. Twin Peaks: The Return - Reaction Thread, parts 17 & 18: "The past dictates the future; What is your name?" Game of Thrones Non-Book Reader Thread, 7.7: "The Dragon & The Wolf"
Twin Peaks: The Return Reaction Thread, Part 16: "No knock, no doorbell."